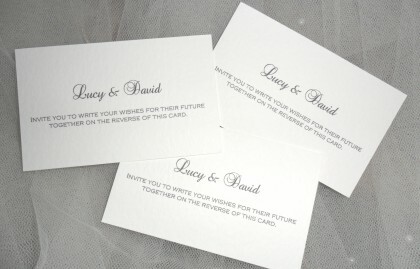 Wedding Guest Best Wishes Advice Cards are ideal to scatter on your reception tables to make it easy for your guests to leave you a wedding day message. No need to wait for a book to circulate, just leave these elegant little cards at the tables for guests to complete at their leisure during the wedding reception. Available in white or ivory, produced using a thick heavy weight hammered textured card, they are printed on both sides (see photographs).